February is around the corner! 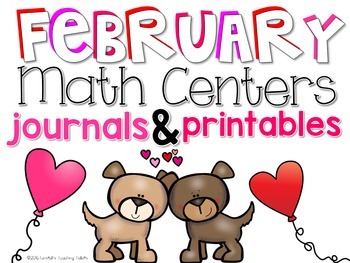 Let’s take a peek at preparing for a fantastic February full of math learning! 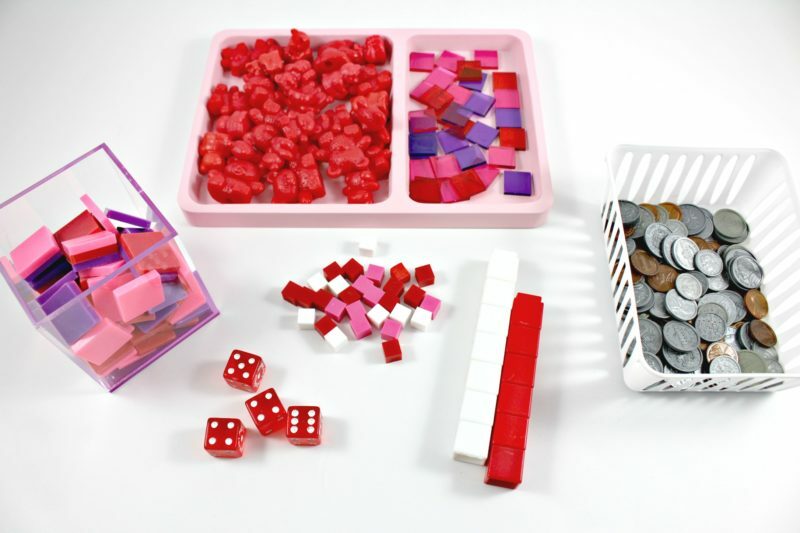 One thing that you can do to entice your learners both at the small group table and at your centers, is to make your manipulatives appear new or different! This is so easy! 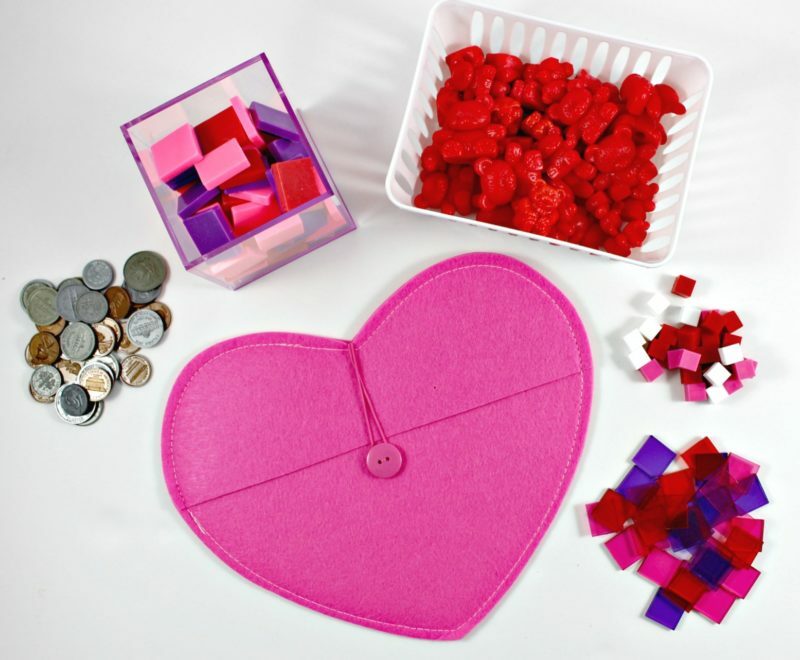 Just take out the manipulatives that you plan to use most, and choose the colors out that work for the season or monthly theme! For February, I chose red, pink, white, purple, and a sometimes light blue! The little containers came from target. 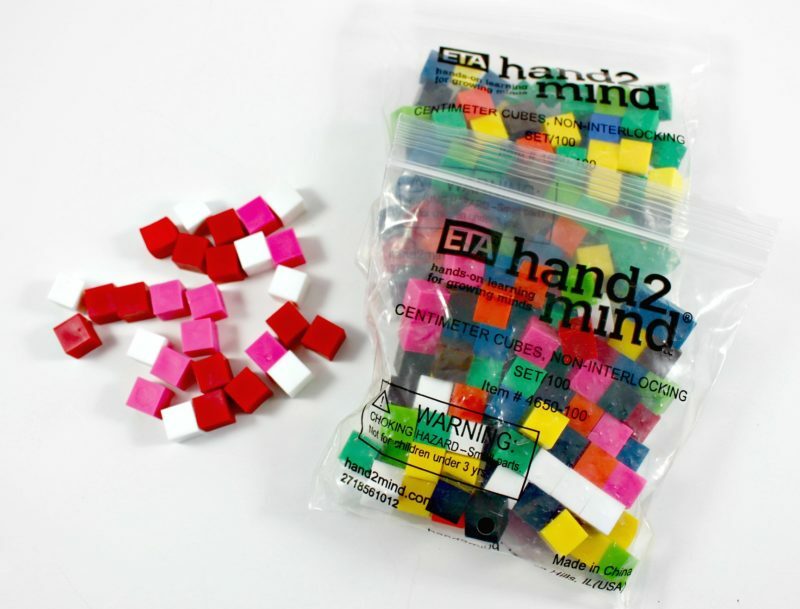 I love these centimeter cubes from ETA hand2mind! 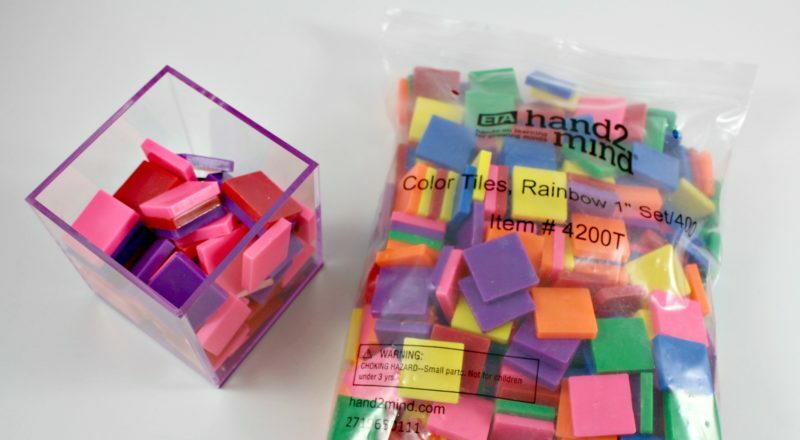 They are multi-colored and are perfect for little hands and can be used for TONS of different math games and activities! Counting, adding and subtracting, measuring, and as “ones” in place value. 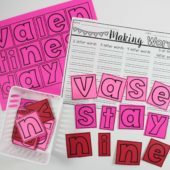 I’ll show how I use them in my February centers. 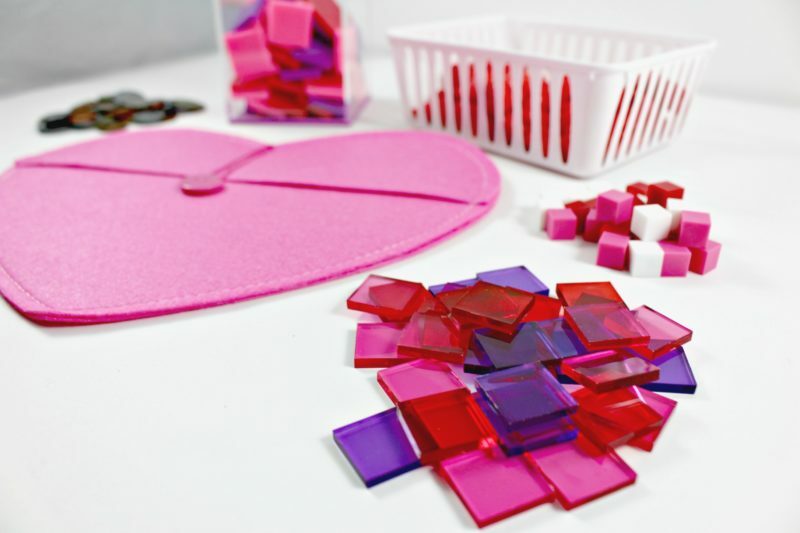 These transparent rainbow tiles are also a favorite. The reason I love them is because the students can still see what they have covered. These are my favorite for games that have numbers being covered up. 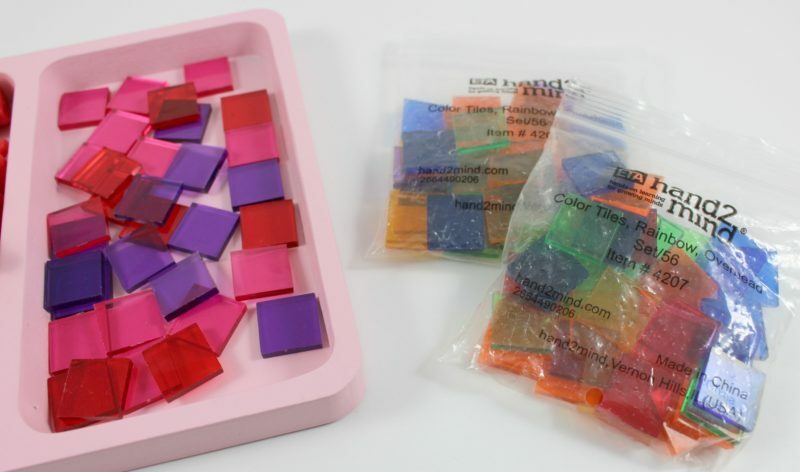 These one inch rainbow color tiles are perfect for ten and twenty frames as well as so many other concepts. Because there are so many colors it makes them perfect for seasonal games. Plus they come in a HUGE bag! 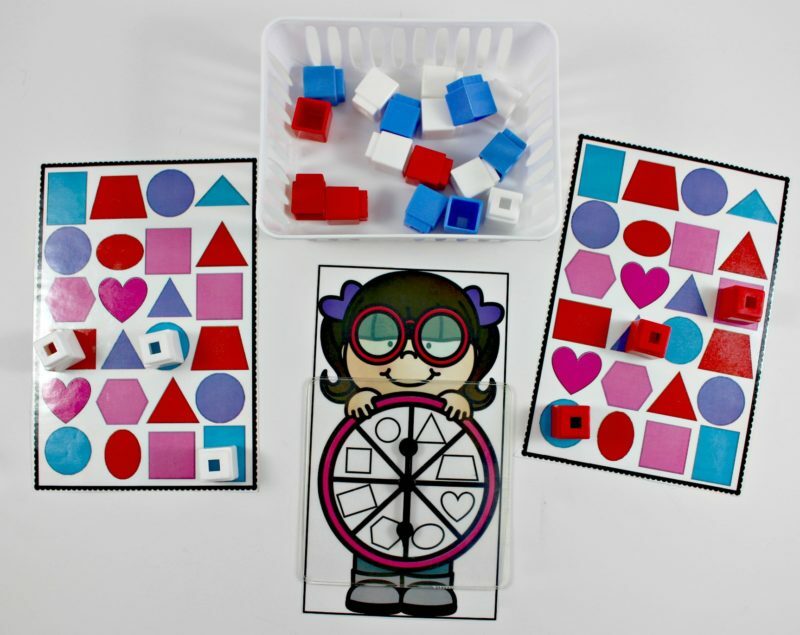 Let’s take a look at the centers for February and how we can use these fun manipulatives! 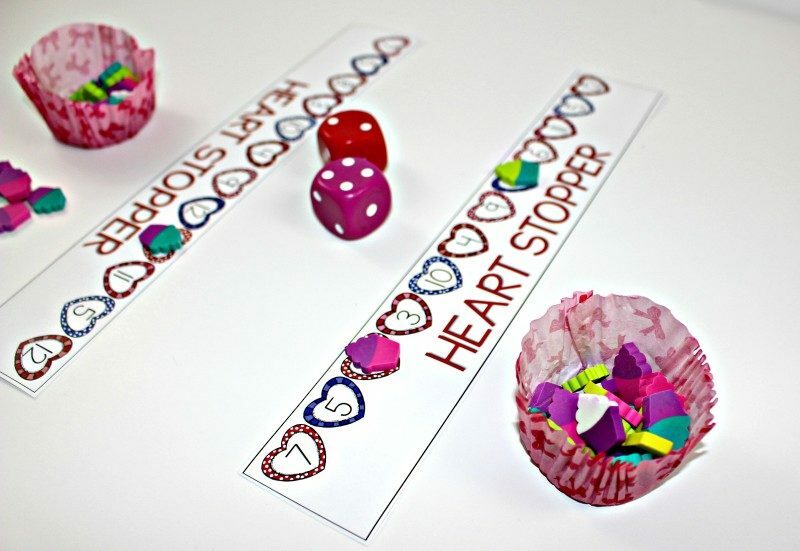 Just having them in the bucket for centers makes me swoon and it has the same effect on the students. 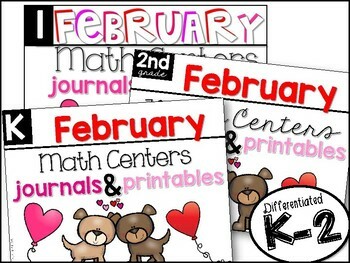 Below are a mixture of K-2 February Centers. 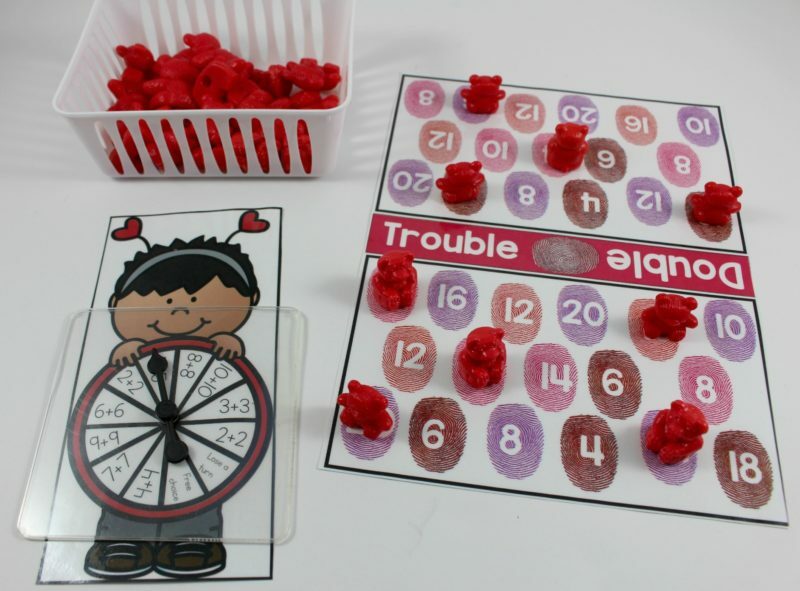 Whether you are working on missing addends at the small group table or in your independent centers, the centimeter cubes can be used as counters. 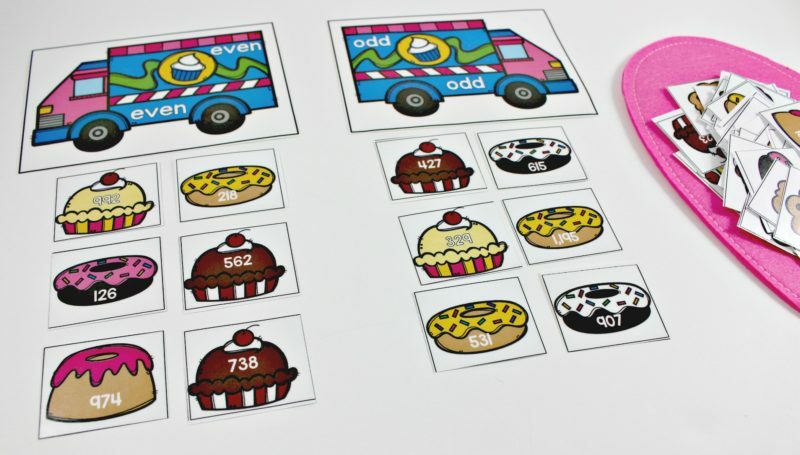 For place value, they make terrific ones to go along with your tens! 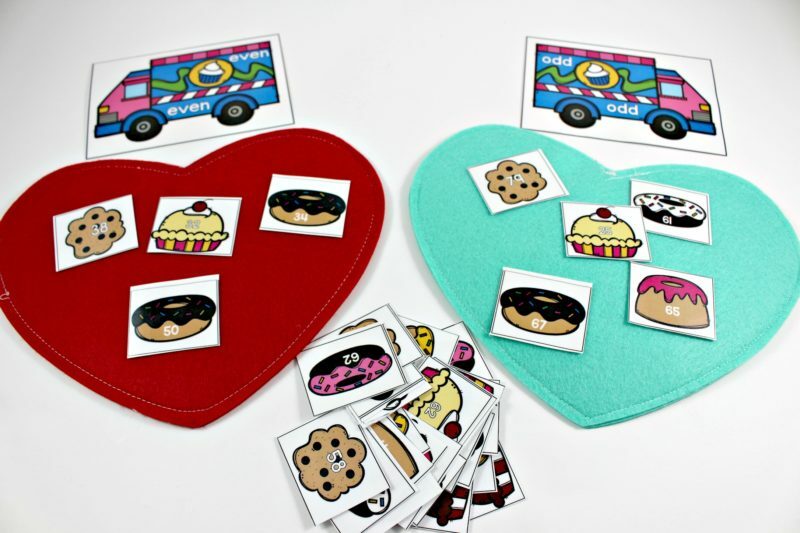 In the February center for K-3 there are different versions of this game. Some are shapes, others are attributes! Students play together trying to cover their own board first. In this first grade center, students are working on doubles facts. Partners face each other and each try to cover their own side of the board by solving doubles facts. Students love to talk about teeth! 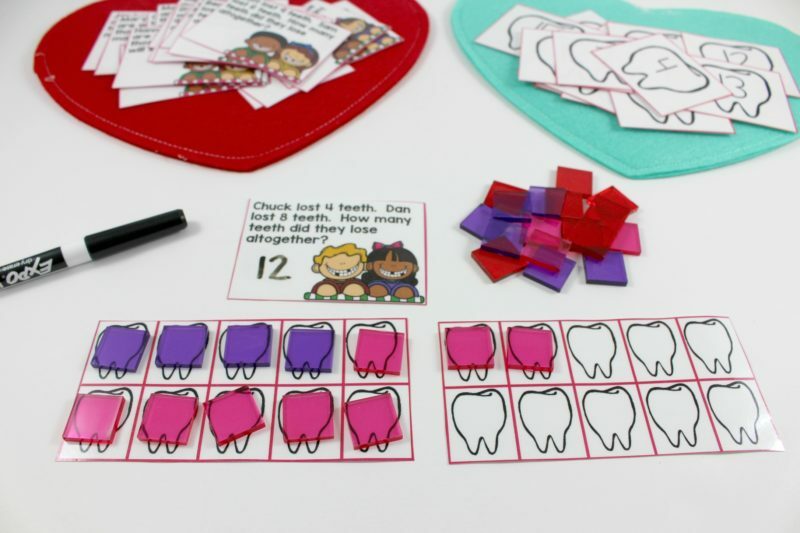 In this center students solve addition and subtraction story problems with the help of these fun teeth and counters. 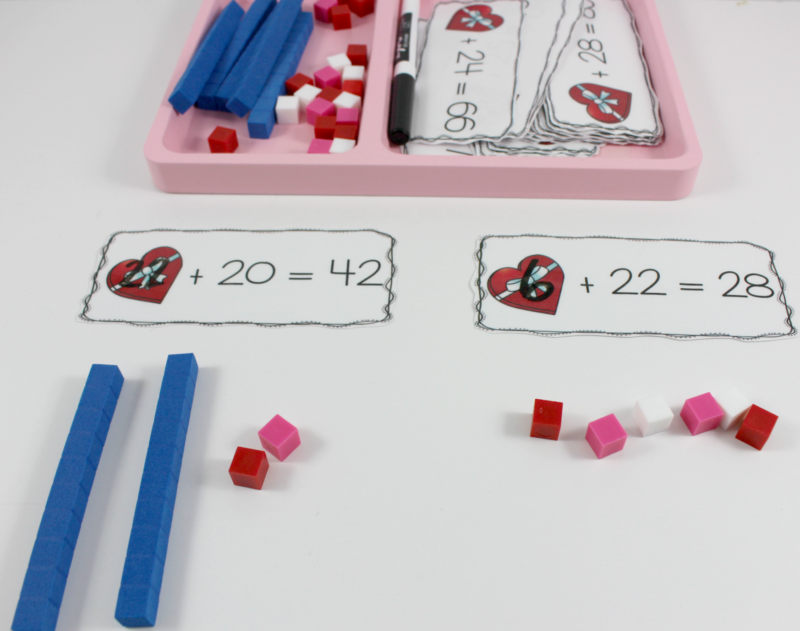 Second Grade solves valentine story problems with double digit addition and subtraction. 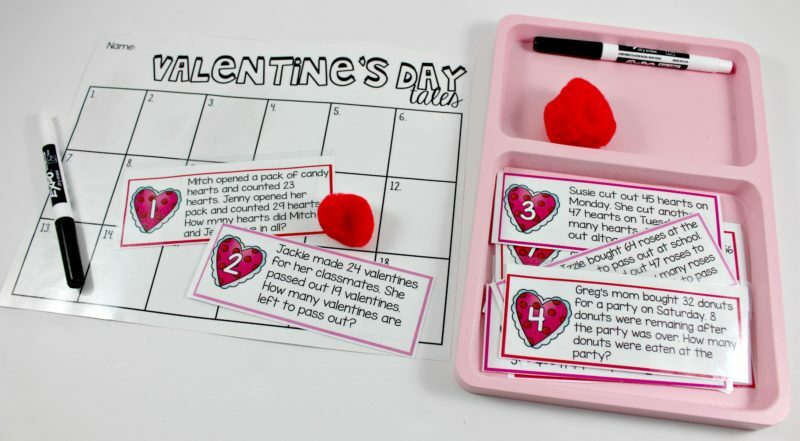 Making tens has never been more adorable! 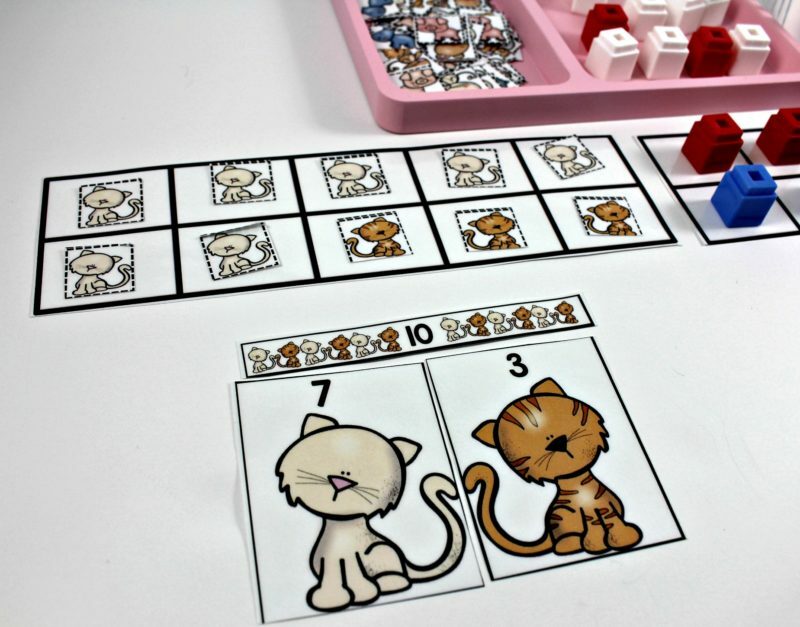 Students must find the two animals with numbers that make ten! 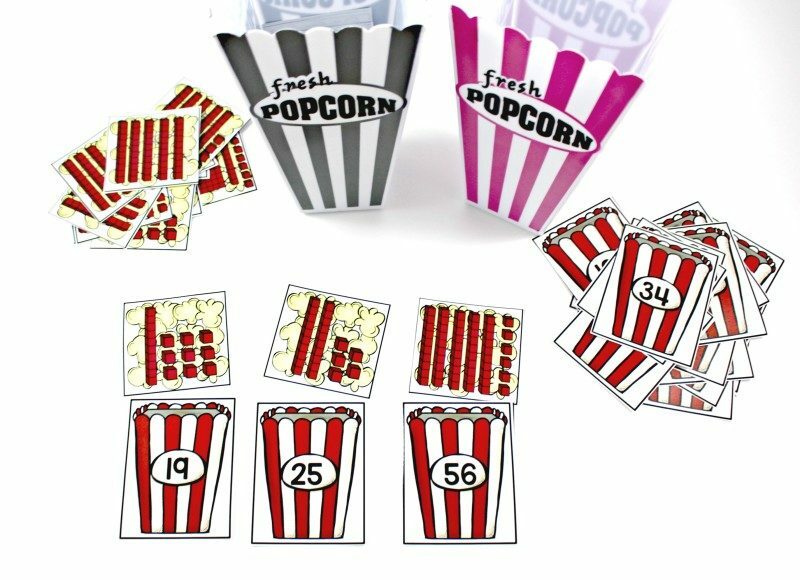 All of the combinations are there and there are multiple animal sets. 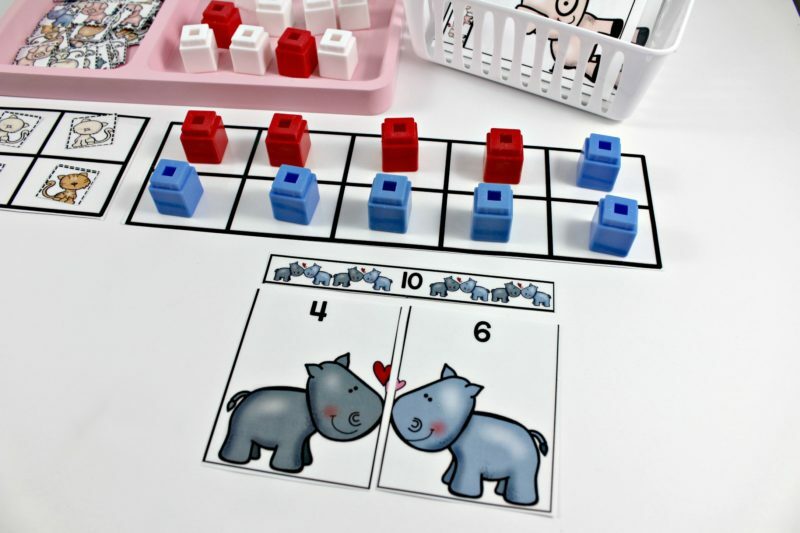 The different colored counters represent the numbers on each animal. Here’s a kinder version of this game. 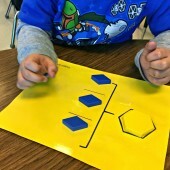 Students are matching the shape they spin to the same shape on the gameboard. 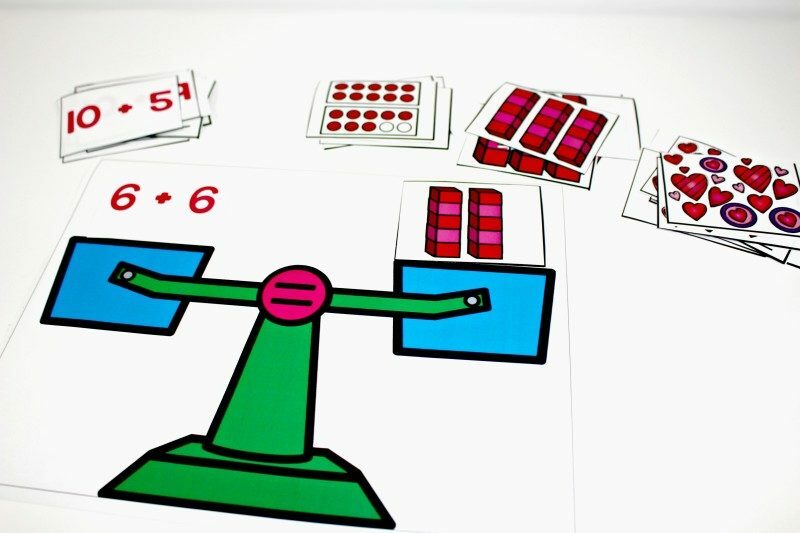 In this game, kinder friends are spinning to match a ten frame to a number on their own side of the game board. 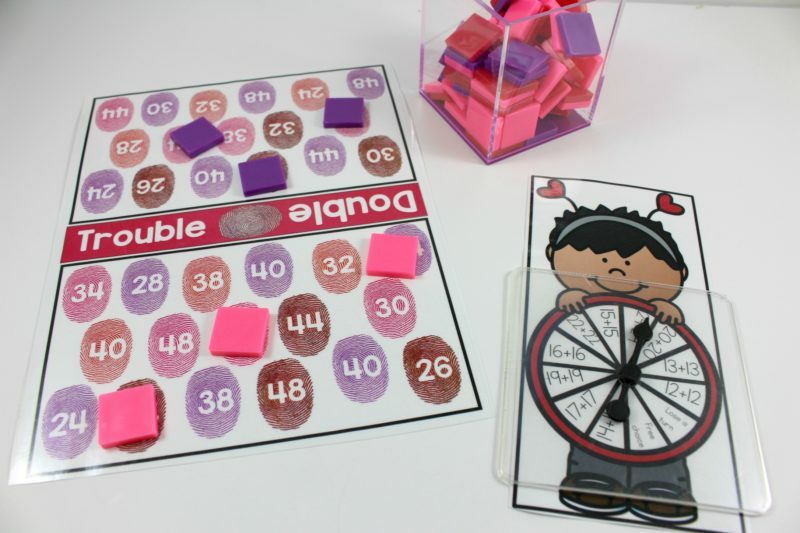 Students can really visualize balancing across the equal sign with this fun center. You can use a real balance for some added fun, or you can use this paper balance. 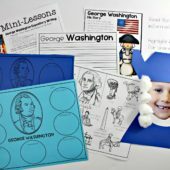 Each grade level has different levels of difficulty. 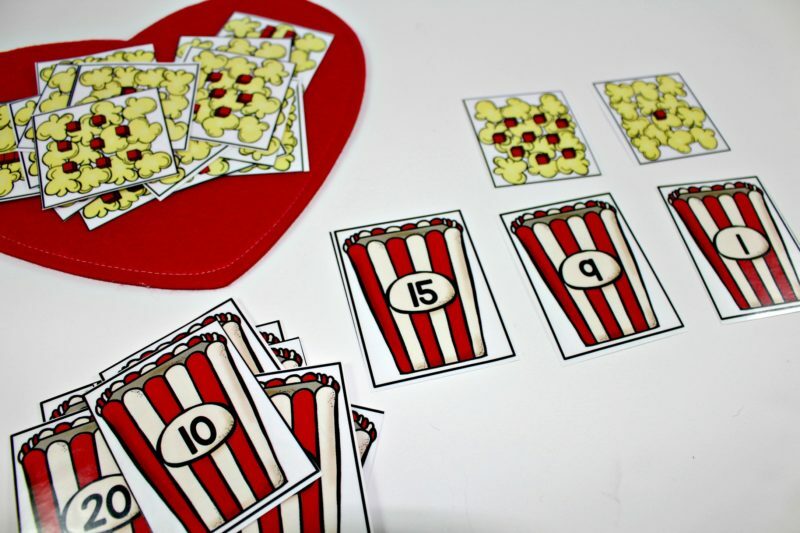 This is another fun center that spiral reviews place value. 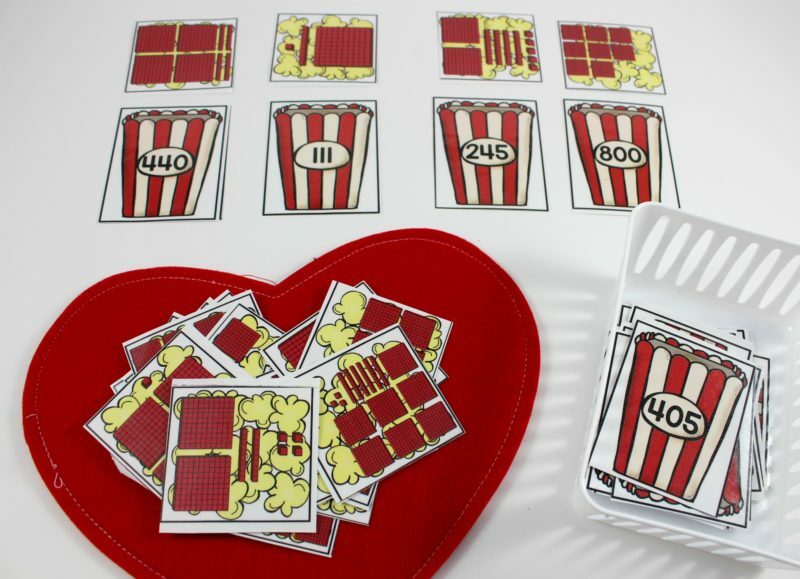 Popping up place value! 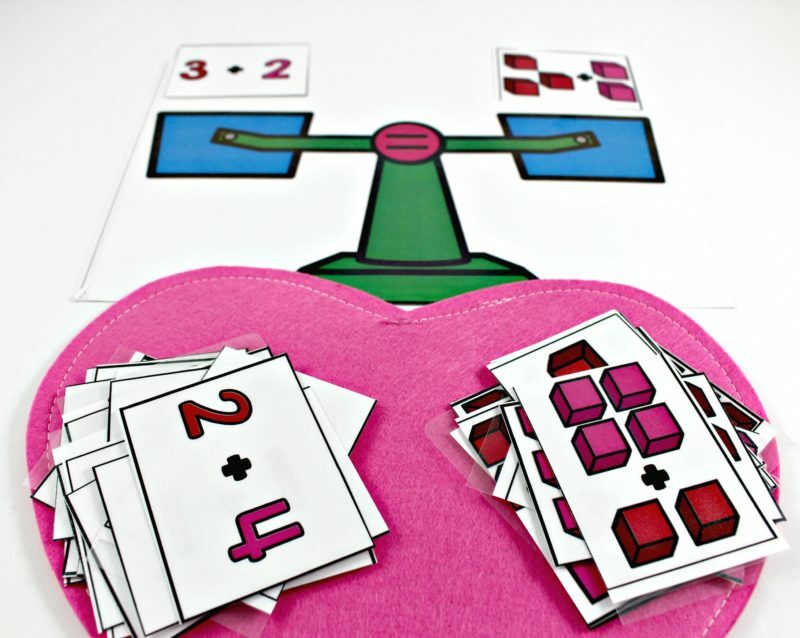 In this strategic game, students can add or subtract to cover a number. The first one to get everything covered wins! 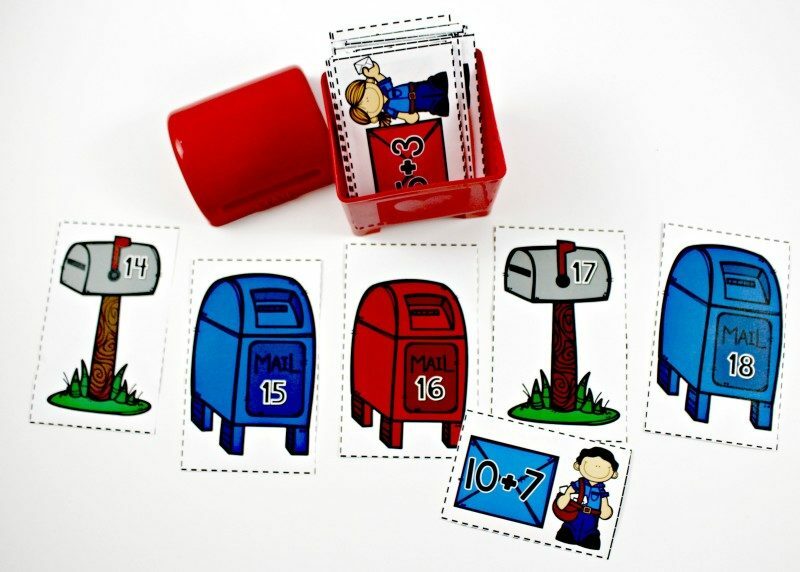 Speaking of deliveries… Students can sort the mail to be delivered by the sums. 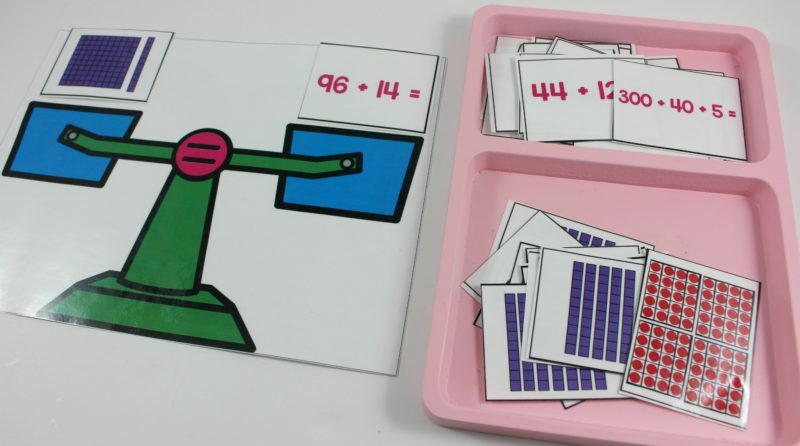 Each grade level has a different range of numbers. Here are the links for each of these center packs! 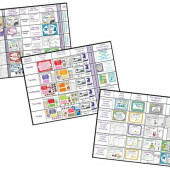 Each one also has ten journal entries and ten printable practice pages to accompany the activities. 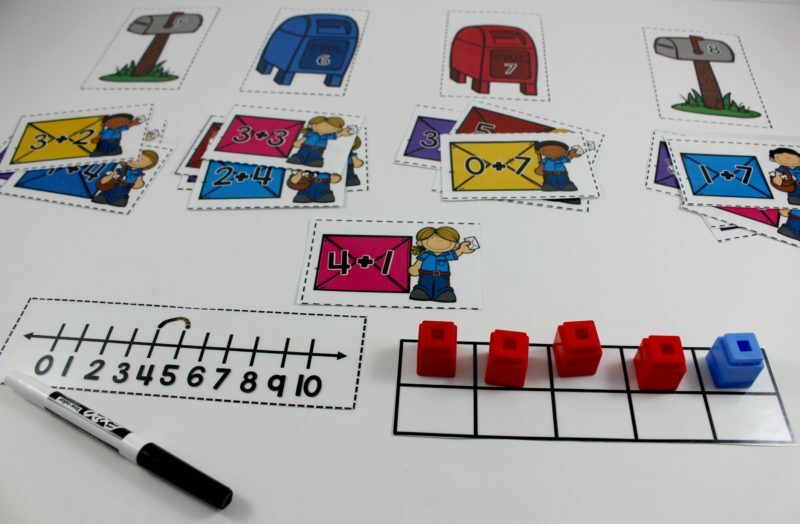 These sets were made with the intention of supplying teacher with multiple station activities all in one! I love how hands on your centers are! 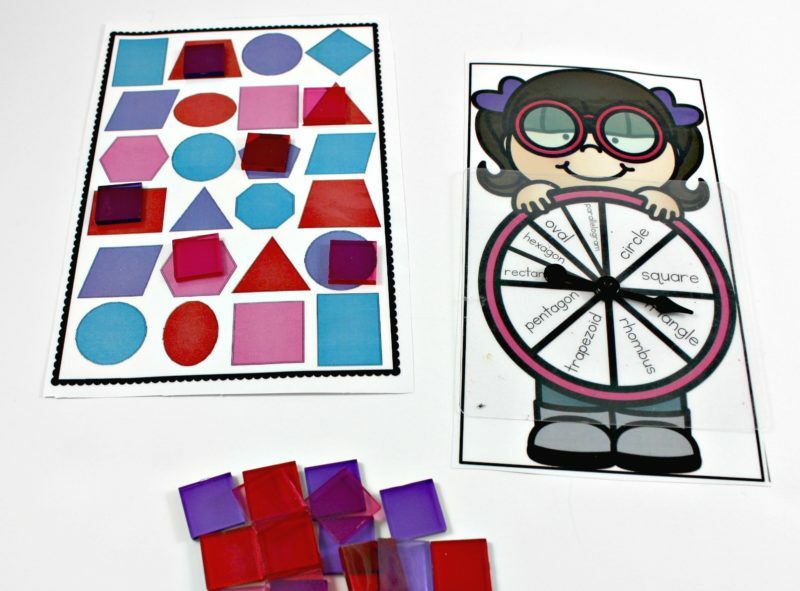 How long do you take to teach each center and how often do you change the centers? I am in my 5th year teaching (3rd year in kindergarten) and do my literacy centers in the morning and developmental centers (integrated math and social sciences) in the afternoon. I am always looking for ways to make centers run more smoothly. Many times I will introduce a center right after teaching our whole group mini-lesson for math. If it is a center which needs more support, I will introduce it in small group before putting it out the next week. Many of my centers follow the same format, so there is a lot less time needed to introduce and explain after the initial month. Thank you so much for your comment! Your math and Lit Kit bundles are the best products I’ve ever purchased. I use them every day and l LOVE them!